Genetic mutations in genes governing wheat threshability were critical for domestication. Knowing when these genes mutated during wheat evolution will provide more insight into the domestication process and lead to further exploitation of primitive alleles for wheat improvement. We evaluated a population of recombinant inbred lines derived from a cross between the durum variety Rusty and the cultivated emmer accession PI 193883 for threshability, rachis fragility, and other spike-related traits. Quantitative trait loci (QTL) associated with spike length, spikelets per spike, and spike compactness were primarily associated with known genes such as the pleiotropic domestication gene Q. Interestingly, rachis fragility was not associated with the Q locus, suggesting that this trait, usually a pleiotropic effect of the q allele, can be influenced by the genetic background. Threshability QTL were identified on chromosome arms 2AS, 2BS, and 5AL corresponding to the tenacious glume genes Tg2A and Tg2B as well as the Q gene, respectively, further demonstrating that cultivated emmer harbors the primitive non-free-threshing alleles at all three loci. 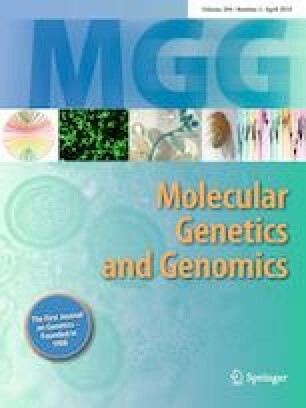 Genetic analysis indicated that the effects of the three genes are mostly additive, with Q having the most profound effects on threshability, and that free-threshing alleles are necessary at all three loci to attain a completely free-threshing phenotype. These findings provide further insight into the timeline and possible pathways of wheat domestication and evolution that led to the formation of modern day domesticated wheats. The online version of this article ( https://doi.org/10.1007/s00438-019-01544-0) contains supplementary material, which is available to authorized users. The authors thank Megan E. Overlander and Samantha Steckler for greenhouse and technical assistance. Mention of trade names or commercial products in this article is solely for the purpose of providing specific information and does not imply recommendation or endorsement by the U.S. Department of Agriculture. USDA is an equal opportunity provider and employer. This research was supported in part by funds to S.S.X. provided through a grant from the Bill & Melinda Gates Foundation to Cornell University for the Borlaug Global Rust Initiative (BGRI) Durable Rust Resistance in Wheat (DRRW) Project and the U.S. Department of Agriculture–Agriculture Research Service (USDA–ARS) Current Research Information System (CRIS) Project No. 3060-21000-038-00D. Jyoti Sharma declares that she has no conflict of interest, Katherine Running declares that she has no conflict of interest, Steven Xu declares that he has no conflict of interest, Qijun Zhang declares that he has no conflict of interest, Amanda Peters Haugrud declares that she has no conflict of interest, Sapna Sharma declares that she has no conflict of interest, Phillip McClean declares that he has no conflict of interest, and Justin Faris declares that he has no conflict of interest.